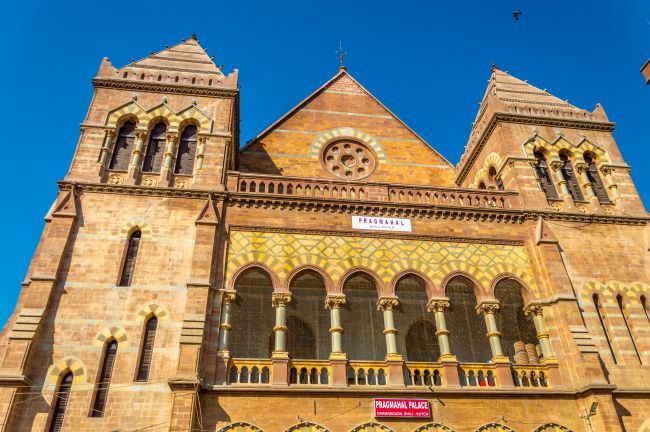 It was a beautiful morning in Bhuj and we had already seen the Sharadbaug Palace, which actually is a small museum in a building near the original Sharadbaug palace, we proceeded towards The other two Palaces The Parag Mahal and Aaina Mahal. Both these Palaces are in a single complex but are under different controls. 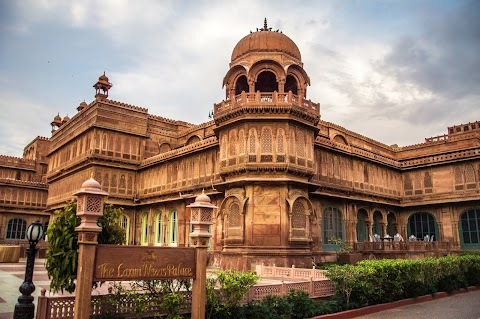 Sharadbaug and Aaina Mahal are with Pratap Sinh family – our hosts for the previous night and Parag Mahal is under the control of his elder cousin. To reach there, we had to pass through a maze of not so wide roads. When we reached the complex two things that hit me. First was the architecture of the Palace and the other was the crowds. If you minus the huge crowds from the scene, It felt as if we were standing in a European city. 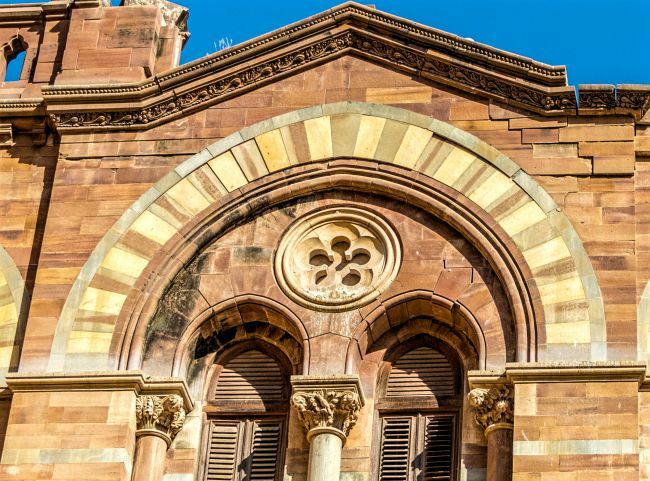 The architecture was Roman-Gothic style and a perfect symphony of Italian marble and local sandstone. The blend of both these stones was very well done and the results were amazingly beautiful. But the show was stolen by The Clock Tower standing tall at 45 feet and the Corinthian Pillars carved out of Italian Marble. 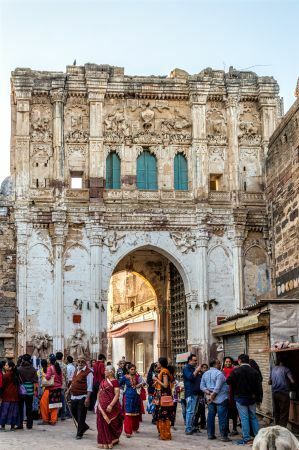 Above is the picture of Parag Mahal on the left and the entrance to Aaina Mahal can be seen on right. The devastation caused by the earthquake is also visible. 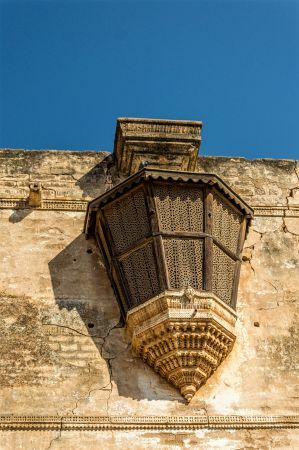 Beautifully carved Corinthian Pillars can be seen in the above window. Such pillars support the entire portico and the windows. The place was swarming with visitors. 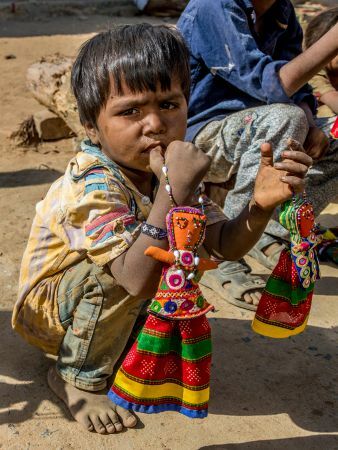 One because of the ongoing Rann Utsav at the White Rann and the start of Christmas holiday season. But the largest chunk was that of school kids. One really appreciable thing that I saw in Gujrat was, any historic monument we visited, we found school trips. I do not know who is behind the initiative, but it was a really laudable step to bring them face to face with the history. However, the sad part was that the students were just walking in a line noisily and nobody explaining to them what they were seeing. It was a great effort getting wasted. I do not feel comfortable and enjoy places which are crowded. 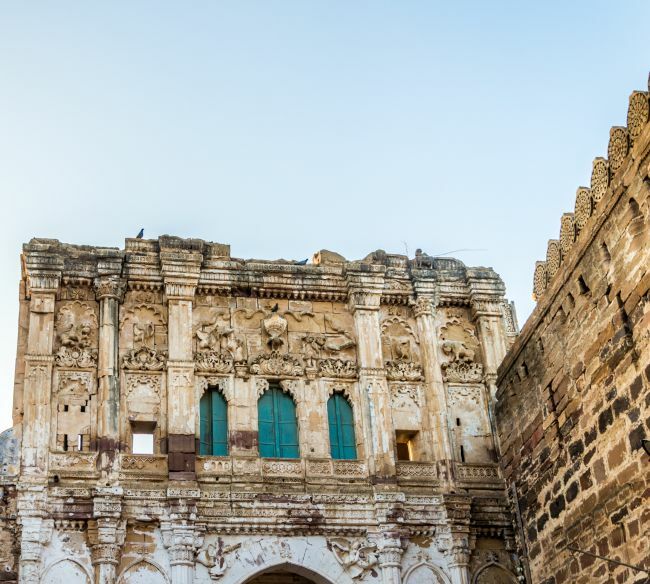 The biggest attraction in this palace was the durbar hall, which had been restored. It had beautiful statues and chandeliers. The colour combination of gold and white looked beautiful. However, in spite of buying the camera ticket, I did not feel like clicking a single photograph due to too much of rush and noise. Soon we were out of the Palace. Another attraction of this palace is to climb up the tower and have a 360-degree view of the city, but there was a beeline of people and students going up and coming down, so we gave it a skip. The position at Aaina Mahal was no better, and we did not even enter it and decided to head for Nirona the most famous artisans' village. 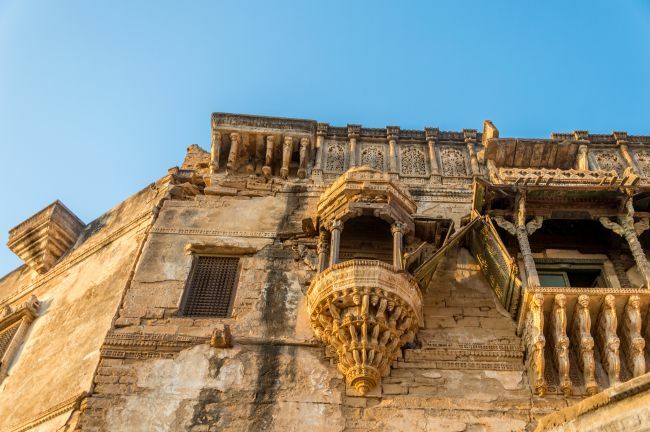 We were to return to Bhuj after one day and decided that we will surely visit this complex again as it was the place, which was the symbol of Kutch's erstwhile glory. 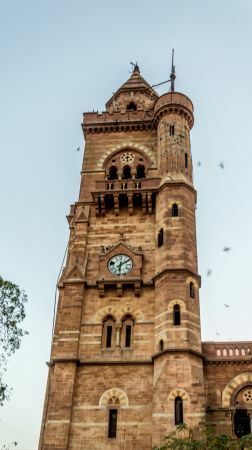 Challenging the European style building of Parag and Aaina Mahal was a building in Indian architectural style. Though in shamble, it still sings a saga of the grandure of this building once upon a time. This was Rani ka Vas. It had very ornate Jharokhas and balconies. 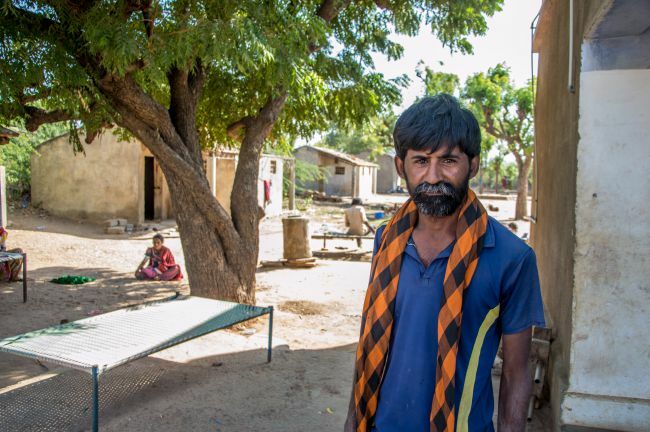 A dusty village nearly 40 kilometres from Bhuj is a house for three unique arts namely Rogan art, copper bell art and woodcraft. 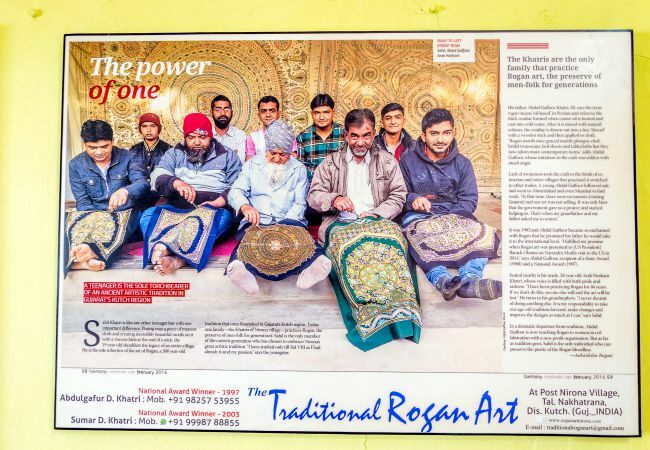 The village shot to fame when Prime minister Sh Narendra Modi gifted the Rogan art painting to President Obama during his visit tothe US in 2014. 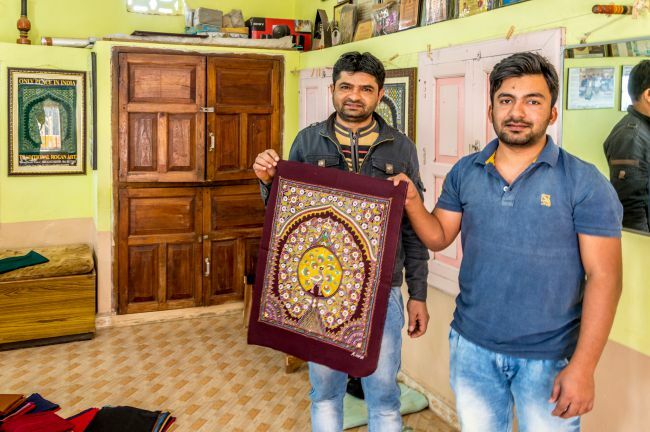 This village shows how adding finesse to a traditional art can bring it on the international platform. This art is what shot Nirona to fame. This art is practised by the Khatri family of this village. They give credit of keeping this art alive to Gafoor bhai. This art was actually used by their forefathers to create designs on Ghagras and cholis worn by womenfolk. They had some samples of those designs and the painting on them was very basic and crude. Then the art almost died. Gafoorbhai worked as a labour and kept on practising this art and also brought finesse to the art and today this art has touched the zenith. In this art, Khatris boil castor oil and convert it into a jelly form. Then colour is added to the jelly and it looks like coloured bubblegum. With only one small tool which looks like a small steel rod and Roghan stuck at its one end, beautiful patterns are created on the cloth. 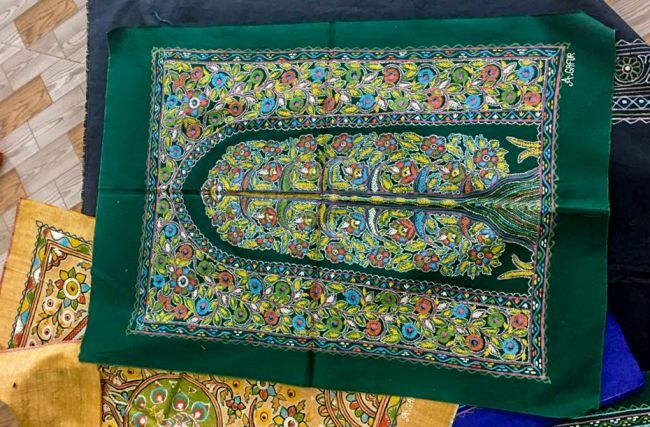 The beauty of this form of painting is that there is no prior drawing or impression on the cloth and the artist creates the final painting directly on the cloth. As per Khatris, the art of converting castor into jelly is their family secret. Presently they have 16 National awardees in their family and presently their eighth generation is involved in this art. Please see the video below to understand Rogan Art in a better way. This again is an art which rose up from the very basic application and is practised by two families in Nirona. The bells earlier were produced here to be tied around cattle's neck. To differentiate between two different herds, the bellmakers excelled in the art of creating different sounds in different bells. 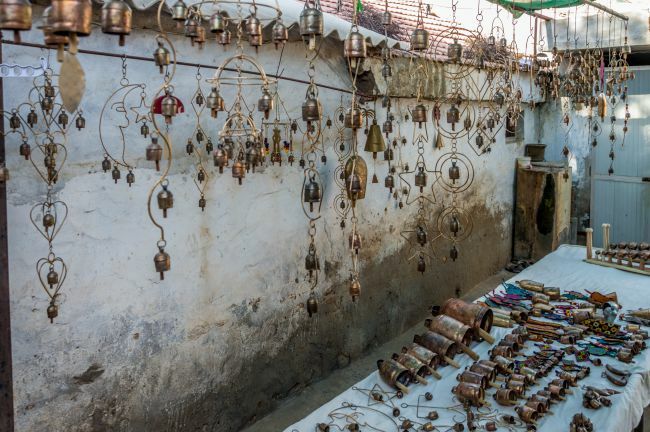 Today the art has been refined to create various types of bells producing a variety of sound ranging from Sa, Re Ga Ma Pa to the chirping of birds to a many more. In this process, the iron bell is first coated with chemicals and then coated with mud. After that, it is baked in a herth to give a copper coating to the bell. After cleaning, polishing and adding a wooden gong to the bell, the men of the family who are masters of the art, add a different sound to the bell by just hammering at the rim of the bell. 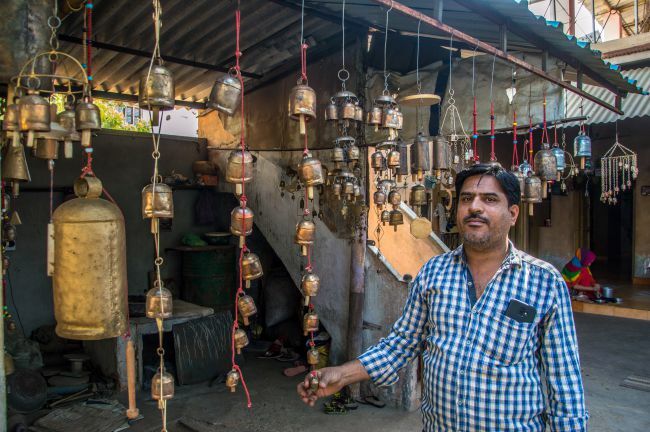 They excel in the art of making a bell sound differently and know how to hammer it to create a different sound out of the same bell by hammering it in a different way. To see a live demo of this process of imparting the ringing quality to the bell see the video below. This art is again practised by a family. 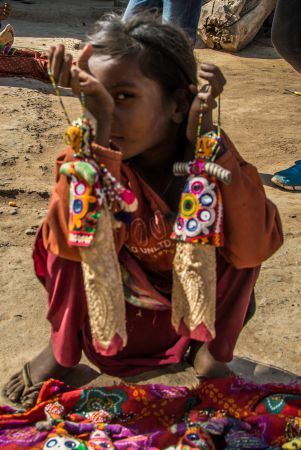 They create small wooden articles like different types of rolling pins, Dandia sticks etc and paint them beautifully using lac and adding natural ingredients to it like neem leaves and red stone etc. However, the bad thing about them is that even very young kids are also involved in this and the family uses them to lure the customer. 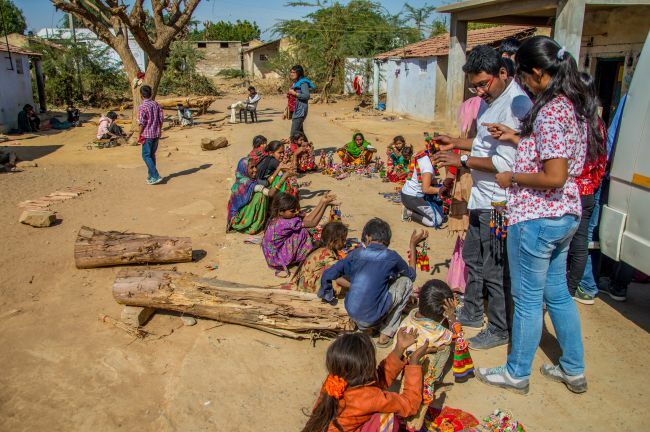 When we reached there, a Tempo traveller full of tourists was there and the very young kids as young as 3-4 years were sitting in a circle with some hand made toys luring the customer with their innocent looks. I felt bad about it. But the product and the procedure was awesome. 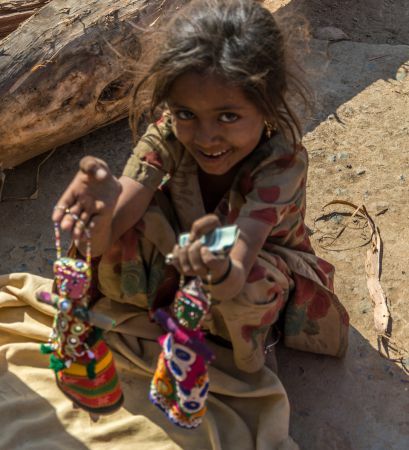 It was heart-wrenching to see the kids who should be playing with those toys and studying selling the toys. After appreciating the art of Nirona and Purchasing a string of copper bells producing Sargam, we left Nirona to our next destination Hodka. Rann Utsav is held at the starting of white Rann at a Village called Dhordo, and a tent city is set up for Rann Utsav. But, tent city is exorbitantly costly for a budget traveller like me and costs nearly 20,000/- for a family of three for one day. So as an alternative, a lot of Eco-friendly resorts with help from Government have come up at a village called Hodka nearly 12 kilometers from white rann the place for Rann Utsav. For Nirona, we had to take a detour from Bhuj Dhordo Road. Soon after leaving Nirona, we were back on the main road and cruising towards white rann. A BSF check post is set up at Bhirandiara. Here the identities are checked and permit for white Rann is issued. We also got into line for the same. The process was smooth and with the permit to visit white Rann under our belt, the excitement was on the next level. Within no time, we were at Hodka. 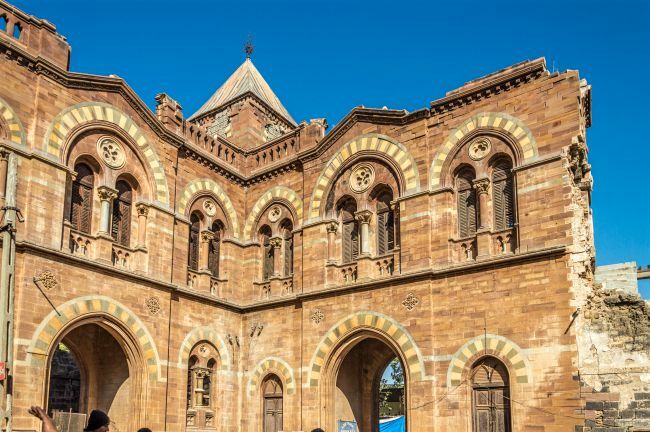 I'm surprised to see the European architecture of Parag Mahal. The Rogan art is beautiful. Thanks for sharing the video. Also the chajjas of the mahal have so intricate art. Actually the Rajas of British era hired British architectects to build their palaces and so the European architecture had a lot of affect on the designs of the palaces. Wow this is a good post! Nice write-up with beautiful pictures 👍 Thanks for sharing. Thank you for the appreciation. The pleasure is all mine.